If you were asked to name one place that’s more in thrall to the car than the UK, most people would say the USA. That’s why, when American cities concerned about road safety, pollution and congestion have wanted to rebalance their roads to favour healthier and less polluting alternatives, they have had to make their case in very strong terms. This has resulted in studies that show the impact of pedestrian and cycling improvements on safety as well as on travel preferences, on house prices and on local businesses. The outputs from these American studies confirm what the Dutch and Danish, amongst others, have known for a long time – that safe liveable streets make for healthy, attractive and vibrant communities. They also mean we now have data we can use to predict the impact of making similar changes in Gosforth. In particular we can see how businesses on Gosforth High Street might be impacted if protected cycle lanes were to be installed. Protected cycle lanes were one of SPACE for Gosforth’s four key asks for the High Street. This is what the studies say. 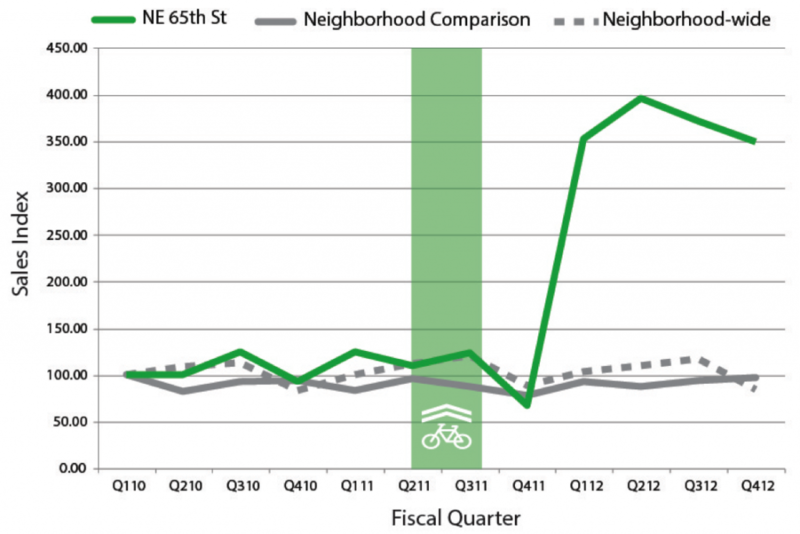 Seattle: A study in Seattle, which has very similar weather to Newcastle, used retail tax data to look at the impact on businesses in two locations where cycle lanes were installed. As the authors say “numerous businesses wrote to the city in opposition to the new facilities planned on their streets“. What happened? In one location there was no impact, the businesses continued to perform in line with rest of the neighbourhood. In the other, “NE 65th St experienced a 350% increase in sales index, followed by another jump to 400% sales index the following quarter“. On Gosforth High Street fewer commercial vacancies means fewer empty shops. While all these studies show varying levels of improvement, the key thing is that in all cases businesses do benefit, even if installing cycle lanes results in fewer traffic lanes or fewer on-street parking spaces. Other studies give insights into why this might be the case. Two key results stand out. More people cycling means more people passing and stopping at shops. 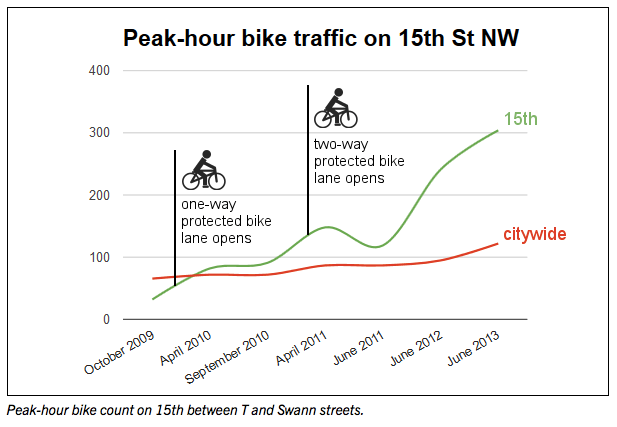 This graph from Washington DC, shows the number of people cycling trebled after protected cycle lanes were installed on 15th St NW. Other studies such as this one from the University of British Columbia in Canada also show that protected cycle lanes (cycle tracks) dramatically improves the safety for people using them compared to no cycle lane or white lines painted on the road. Installing protected cycle lanes can also improve the experience for pedestrians. On Gosforth High Street this should mean that bollards used to prevent pavement parking can be removed, freeing up 2 feet of additional pavement space. In Portland they did a separate study on spending habits. This found, not surprisingly that at supermarkets drivers spent more than cyclists, pedestrians and bus users over a month – but for smaller shops, bars and restaurants, cyclists outspent drivers in every category. All high streets are different of course but there is no reason these same positive business outcomes can’t happen on Gosforth High Street. Encouragingly many businesses we have spoken to, while having reservations about other aspects of the Council’s proposed schemes, have been supportive of making the High Street safer for cycling as well as for other improvements for pedestrians and overall safety. And if you still don’t believe this is possible, this video from Holland shows just how easy it is to shop by bike when the right facilities are in place. * The website http://www.codeminders.com/weather_similarity/ shows world-wide cities with similar climates. The default is to show San Fransisco but if you zoom out then scroll east (right) you should be able to find and click on Newcastle. Port Angeles, which is about 80 miles north west of Seattle, has a 99% match with Newcastle. How do you carry your shopping by bike ? How do you ride a bike when you are 70 plus ? Cyclists and greens properganda !!! Stewart – you can’t spot a ‘cyclist’ in a restaurant because they are normal people and look just like anyone else!! I don’t think this is supposed to suggest cycling should be compulsory. I’ll vary my transport depending on what I’m going to the high street for. For a big Sainsbury’s shop the car is necessary but otherwise, a back pack if I’m walking or panniers on the bike do the job just fine. Frankly, it would feel daft to me taking the car to the High Street when all I have to do is get small items, visit the bank or get my hair cut. Taking parking space from someone that needs it for a big shop also seems a bit unnecessary. Where I’d appreciate a few more spots to chain the bike up there are at least 4 locations that are secure and convenient for bikes and there’s usually a space available. I don’t think is propaganda either, just challenging the received wisdom that it’s only car journeys that are essential to the local economy. I have lived in Gosforth for almost 40 years and would like to see the High Street become more community orientated like Chillingham Road, Acorn Road or even The West Road in Fenham but that is never going to happen. The City have decided that The High Street is the main route North from the City Centre. Their scheme is an endeavour to reduce congestion but to my mind reducing congestion will only increase traffic as most drivers are used to some level of congestion. Removing the pavement bollards would tidy up the pavement, get rid of the illegal advertising covers, but what level of cycle lane protection would be required as I have already witnessed vehicles parked on the pavement opposite the High School where there is a protected lane. I appreciate it that it is early days but has the stopping up of Moor Road North except to cyclists had any impact on the number of cyclists or the businesses on the High Street. The only effect I have noted is that finding a parking space looks easier. Transport for London have summarised evidence for the economic benefit of walking and cycling.